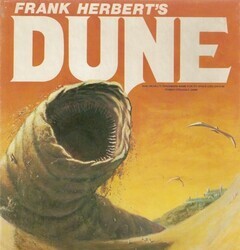 Frank Herbert's Dune is a sci-fi epic that has received multiple video game adaptations. At least three new games based on Frank Herbert's sci-fi epic Dune will be making their way to consoles and PC over the next six years. Funcom, the developer behind Conan Exiles and Conan Unconquered, has signed a contract with Legendary Studios to build at least three new Dune games. Exact details are still spotty, but rumor has it that Funcom is currently working on an open-world multiplayer Dune game. In Frank Herbert’s classic sci-fi series Dune, the spice melange (one of the focal points of the narrative) is a highly-addictive substance that is so coveted, factions are willing to fight interplanetary wars over it. The classic PC game adaptations of Herbert’s work are almost as equally addictive and cherished, so much so that game developer Funcom and publisher Legendary Studios are bringing three or more new Dune games to PC and consoles over the next half-decade. Details are still extremely spotty, but what has been confirmed is that Funcom (the developer behind Conan Exiles) has signed a six-year contract with Legendary Studios to create and distribute “at least” three new Dune games. The games will come to both PC and consoles, and rumors are swirling that Funcom has already started developing an open-world multiplayer game set in the Dune universe. As TechRadar points out, Funcom worked with Petroglyph, another game developer, on the real-time strategy (RTS) game Conan Unconquered. You may have heard of Petroglyph recently when we reported on the upcoming Command & Conquer remakes. Petroglyph has several former Westwood Studios employees on staff, and Westwood was the developer behind Dune 2 back in 1993, a game that arguably vaulted the RTS genre into popularity. We’ll report more details as they come along.